The Westin Hotel is in a terrific position just outside of the old town of Valencia and has supoerior ammenities as you would expect from this premium hotel chain. Room upgrades, suites and extra nights are available on request at the Westin with all being dependant on availability. Single room occupancy rates can be quoted on request. 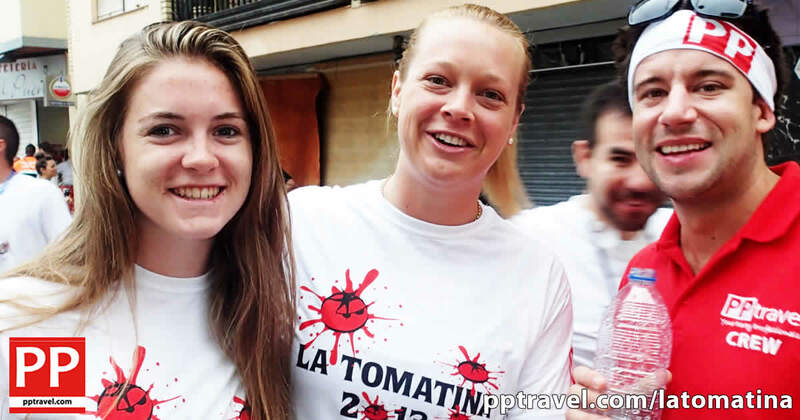 !Entry ticket to La Tomatina .. All PP Travel tours include the entrance ticket that has been introduced by local authorities to enter La Tomatina! Your private transfer will collect you from Valencia airport to arrive at the Westin Hotel at your leisure throughout the day. Meet with your PP Travel representative at 5pm this afternoon for a full greeting and tour briefing session so you can be totally prepared for the tomato battle on Wednesday. Today we have a guided tour of Valencias old town area with excellent local guides from Valencia Guias. In the evening we run our pre-party at the amazing outdoor UMBRACLE nightclub in the heart of the amazing city of Arts and Sciences in the middle of the old river bed that runs through the city. There will be a dedicated reserved area for our 5* hotel clients and there will be some drinks included to kick off the evening. After an early breakfast, we transfer by coach to Bunol journey time approximately 1 hour. The Tomatina festival commences around 11am, following the desperate attempts of the human ladders to grab a large ham at the top of a greased pole in the centre of town. Several dump trucks full of tomatoes are emptied into the main, very narrow street of the town and then the fun really begins with the locals and other travellers covering each other in tomatoes. After approximately one hour and gun blast signals the end of the fight and everyone goes for a welcome shower (if they can find one) and joins in the fiesta. We depart Bunol mid afternoon returning to our hotels in Valencia for another much needed wash and rest. Tonight is a free night and a chance to head into the fabulous old town of Valencia or perhaps try the wonderful restaurants that line the beach front. We also offer free admission (until 9pm) to the official La Tomatina After Party. This is nearly as big as the event itself, with over 3000 people attending this great outdoor event. Our La Tomatina tour finishes after breakfast today. For those of you who wish to stay on extra nights they are available on request although they must be booked before the tour begins through PP Travel to be certain that a room is available.